The use of pictures in advertising is common since they convey the message better than text does. And not just that but also when a customer can relate himself with the brand, it is more likely that he would like to associate with it. Therefore, businesses use photos that people easily connect with. For this to be successful it is important that the photos used in the advert exhibit cultural and ethnical connect with the people of the place where the marketing is carried out. While the big businesses have the luxury to produce proprietary imagery for their marketing, all small and medium businesses have lesser options apart from internet stock photos. Businesses in India are no different; but the challenges that we have in finding stock images are of a different nature from rest of the world. There are plenty of websites that offer stock photos of Indian faces and ‘India’ theme, but most of them come with issues. We see that customer acceptance to using Indian Stock photos is a challenge for more than one reason. Being in the media development industry for Marketing, we often see that Indian stock photos need the following improvements. Variety in events: Stock photos will be needed for a large variety of situations. In the current stream of stock photos, we do not have the luxury of variety. It could be a girl child playing with clay, or a teenager rolling on a skate or a housewife doing some household duties or a middle aged man spending time with his family – options are way too less compared to that of an American face. Addressing India’s diversity: One of our clients wanted the photo of a tamboola in their marketing collateral. In many parts of south India, especially in southern Karnataka and Tamil Nadu, tamboola is a popular gesture extended to any guest who attends a function; it is a package of beetel leaves, betel nut and a coconut/fruit. Unfortunately we don’t have a single stock image website selling such photos. We had to click it ourselves when we needed it for a project. India is a country of many countries within. Its diversity is unmatched anywhere in the world. While Ganesh Chaturthi and Deepawali are popular in most parts of India, Yugadi, and Varamahalakshmi are more exclusive to South India. While Mysuru is busy in Dasara, Durga Puja spreads colours in West Bengal. 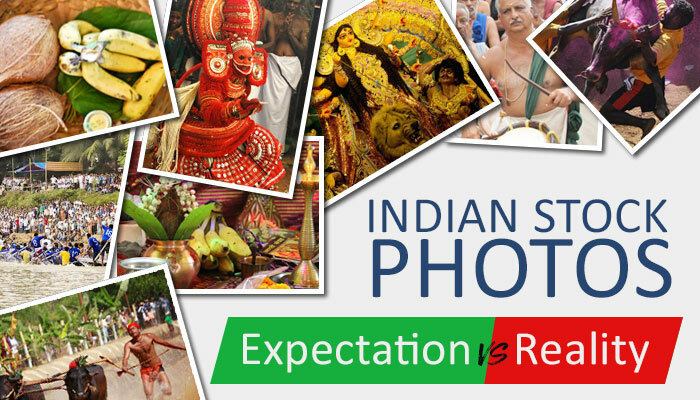 While photos are abundantly available for the more popular festivals, there is a scarcity of photos for the less popular and region-specific festivals & occasions. Also, photos of people wearing various region-specific Indian attires, and in various popular locations across India will be needed. Somehow, Indian stock photos are not available for such needs of customers. Quantity: More than 17% of the world’s population is from India. Also, India contributes heavily to the market shares of many industries. For example, India stood as the third largest market for smartphones in 2016 after China and USA. This means, not just Indians, but people across the world are likely to search for Indian stock photos as they want to sell their products in the sub-continent. There is a global demand but weak supply. We simply don’t have stock imagery that represents many of us. Price Control: Photos are exorbitantly priced on Indian stock photo websites. The high prices act as a deterrent to small-medium businesses looking to buy stock photos. To give an idea, searching for ‘Indian School Kid’ on a more general stock photo platforms like 123rf, istockphoto or shutterstock gives you photos that cost INR 250 to 500 for a medium-quality 300 dpi photo. The average price of a photo of similar quality on another website, which is exclusive to Indian stock photos, is INR 11790! One can easily see the huge difference in pricing. Typically, small and medium businesses allocate a budget of INR 10, 000 – 30, 000 for building their websites. Buying Indian stock photos with that budget is unfeasible. If the pricing is made reasonable, there is a huge customer base that can be tapped into. Quality: To give you an idea about the quality of stock photos specific to India, below we present two images. The first image is a stock photo for the search ‘School kid’. 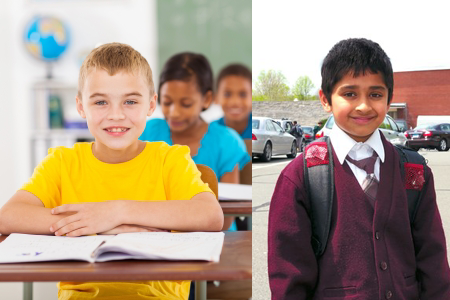 The second image is a stock photo for the search ‘Indian School Kid’ on the same website. The price for both is around INR 200 to 300. We see that acceptance of such Indian stock photos by our clients is low for a simple reason that they are not creative and conveying like the others. The quality of photography is not being on par with the other photos makes the possibility of picking Indian stock photos weaker. Making a community effort to encourage professional stock photographers from all states of India to click and share photos from their homeland showcasing faces, food, festival, clothing, places, etc. This would address the diversity part. Once there is abundance in supply, competition will increase leading to price crash and improved quality. It would be great to have a discussion on this very forum. Your views please.